I'm not sure if this was fixed previously, but the conditions on the side of the street here are dangerous/crumbling, leading to an already narrow portion of the street being dangerous for when two cars are on the road at the same time. I have personally gotten my car stuck here after not being able to see that part of the road had crumbled away, leaving reduced width when there was another car coming the opposite direction. This is indeed an awful corner. Any updates on a plan for this? Thank you! Road is not sloped correctly. Water sitting in potholes constantly. Water always present. Growing mold and slime. Unsafe for my children. This issue was recategorized from Pothole to Stormwater - Miscellaneous. 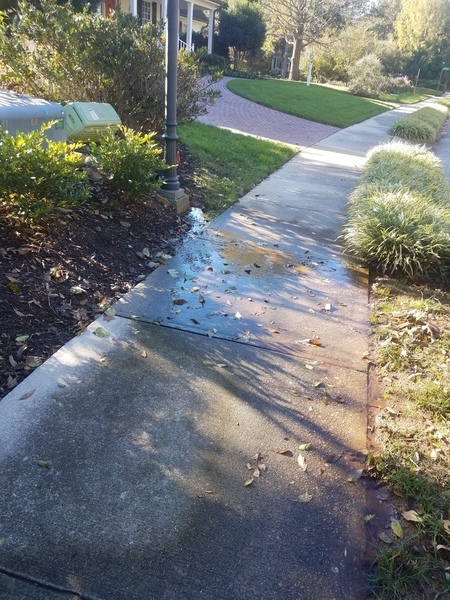 This appears to be some sort of foundation or gutter drain that is saturating the sidewalk daily. This is happening even when the ground is not wet so it might be an underground leak of some sort. This is a public right-of-way and will be particularly dangerous in freezing weather. The location is Bolin Creek Trail, I couldn’t properly locate that in the map. This has been torn down since the hurricane. The last statement in the description should refer to Morgan Creek Lane, not Morgan Bend Lane.